IN some ways the Palestine Railways and Operated Lines - to give them their official title - are the most interesting in the world. They are operated by men of thirty-one different nationalities. They were constructed by French, German, Turkish, and British engineers principally for religious and military reasons, and they are now performing a vital part in the rapid development of an ancient country that has recently been given a new lease of life. They operate in Palestine, Transjordan, and the Sinai Peninsula of Egypt. On the sea-board the trunk line that reaches up from Egypt to Haifa was built during the war of 1914-18 by the British, despite the attacks of the Turks; to the east, the Hedjaz (Hijaz) Railway, built by the Turks, was put out of action by the late Colonel T. E. Lawrence and his Arab allies. Palestine has an estimated population of about one million, the area being about 10,000 square miles. It is bordered on the west by the Mediterranean Sea, and on the south-west by the Sinai Peninsula, the boundary line leaving the coast near Rafa, and crossing the desert to the northern corner of the Gulf of Aqaba, which is on the Red Sea. The eastern border is formed by Transjordan, and the northern by the French mandatory area in Syria. Transjordan exceeds 20,000 square miles in extent. It is inhabited by more than 300,000 people, but the western boundary is not clearly defined, and the population figures are only an approximation, as a great part of the country is desert, inhabited by nomadic and semi-nomadic tribes. This area is separated from Palestine by a line which, approximately, runs south from near the southern end of the Sea of Galilee, through the middle of the Dead Sea to the Gulf of Aqaba. The High Commissioner for Palestine is also High Commissioner for Transjordan. OLD AND NEW FORMS OF TRANSPORT meet at the railway goods sheds at Jerusalem. The railways of Palestine are partly controlled by the British Government and partly by the Palestine Government. There are three main groups of railways in the country. It will thus be appreciated that it is no light task to maintain and work the railways in territory which is diverse in physical character, and is inhabited by people of various racial, religious, and political aspirations, who sometimes express their feelings by direct action. Indeed, the problems that have arisen since October 1, 1920, when the civil administration took over the railways from the British army, have been of an extraordinary variety. These have included planting of trees to keep the sands of the desert from blotting out the track, trying to stop nomads from stealing the rails, speeding up services, and cutting fares to combat intensive road competition; fighting floods and rock-falls, repairing locomotive “war-crocks ” to enable them to operate in times of peace, and, on one occasion, improvising a train manned by British sailors armed with Lewis guns and rifles to act as a kind of light tank during serious riots in Jerusalem. 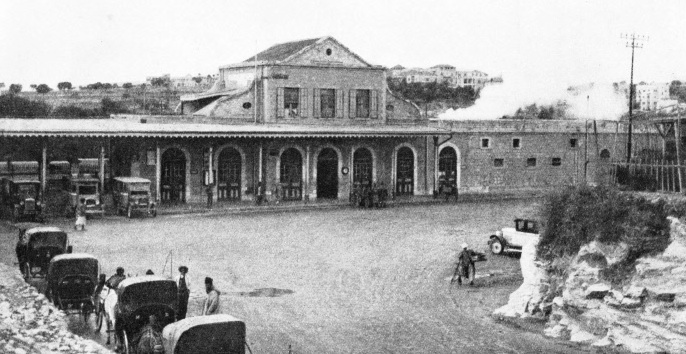 Haifa, the rapidly expanding Mediterranean port at the foot of Mount Carmel, is the headquarters of the railway admin-istration, the new railway workshops being three and a half miles from the station. Extensive harbour works have recently been completed. These will be referred to below. Jaffa, the Joppa of the Old and New Testaments, is the port of Jerusalem. The town is linked with mythology as the place where Perseus rescued Andromeda from the sea-monster, and with modernity by the Jewish town of Tel-Aviv, which has sprung up with amazing rapidity a few miles away. The railway to Jerusalem cuts the trunk line from Haifa to Egypt at the important junction of Lydda (called Ludd by the British troops) where St. George, the patron saint, of England, was buried. A theory has been put forward that the legend of St. George and the Dragon was “borrowed” from that of Perseus at Jaffa and transferred inland to St. George at Lydda. THE RAILWAYS OF PALESTINE and Transjordan. The three main groups shown are the Palestine, the Kantara Rafa, and the Hedjaz Railways. There are about 700 miles of track. There are two railway gauges on the system, one the standard 4 ft 8½ in, and the other 3 ft 5¼ in, or 105 cm. The latter gauge is that of the Hedjaz Railway. This unusual gauge is said to be the result of a mistake in the manufacture of the first steel sleepers which were sent to Damascus, the northern terminus of the railway. The section of the Hedjaz railway which runs in Palestine and Transjordan, is controlled by the Palestine Railways. The somewhat complicated but interesting history of the railways began when the French, in 1888, secured a concession from the Turkish Government to build a metre-gauge line from Jaffa to Jerusalem, the line, fifty-four miles long, being constructed in 1892. It was operated by the Société du Chemin de fer Ottoman de Jaffa à Jerusalem et Prolongements. The next development was the construction of the Hedjaz Railway. This line began at Damascus, where construction started in 1901, and was driven 1,105 miles south to Medina, the second holy city of the Moslems, which contains the tomb of the Prophet Mohammed. Medina was reached in August, 1908. A branch line was built from Haifa - united with Acre by another branch - to Samakh, at the southern end of the Sea of Galilee, thence running eastward to link with the line from Damascus to Deraa. This line from Haifa shed a branch from Afule south through Massoudieh to Nablus. To attack the Suez Canal the Turks built a line branching south from the Jaffa-Jerusalem Railway at Sorek through Beersheba to Maghdaba. Later this line was dismantled. They also extended the branch south from Afule by building a line from Massoudieh westward to Tulkarem, and then south to Ramleh on the Jaffa-Jerusalem line. Of this section the Afule-Massoudieh-Nablus and the Massoudieh-Tulkarem tracks remain as part of the Hedjaz Railway, but the trains which once ran between Afule and Massoudieh, a distance of thirty-seven miles, ceased to run in 1932, because of the lack of traffic, and the track, although it has not been removed at the time of writing, is closed. The line from Tulkarem through Massoudieh to Nablus, 23½ miles long, is still in operation. THE MAIN LINE AT HAIFA HARBOUR was diverted in 1933 to an area of 90 acres of new land reclaimed from the sea by dykes and breakwaters. Material dredged in connexion with the construction of the port was employed to consolidate the reclaimed area. The British were forced to resort to fighting so that they could build their military line from Kantara East, on the Sinai side of the Suez Canal, across the desert to reach Palestine. 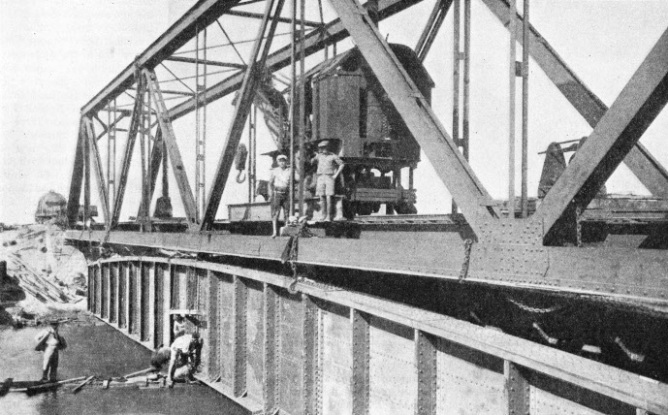 Two Turkish attacks on the canal were defeated in February and March, 1915, and the British began to build the military railway on the standard gauge to drive out the Turks from Sinai and thus safeguard the canal. The Royal Engineers went on steadily, and were not interrupted until the line was nearing Katia. The Nile water was brought across the desert by pipe-line and the track was protected by block-houses and barbed wire entanglements. The Turks suddenly attacked in April, 1916, when about twenty-eight miles of track had been laid. They captured two out-posts held by British cavalry and forced the troops holding the other two to withdraw. They failed, however, when they came up against a small force of British infantry, and suffered such losses that they withdrew some sixteen miles. In August they attacked again. The British general, Sir Archibald Murray, had constructed defensive works at Romani, near Katia, and when the Turks attacked they were defeated so decisively that the Royal Engineers quickly resumed the laying of the metals. Other battles were fought at El Arish (ninety-five and a hall miles), and at Rafa, which is now the frontier station. The frontier at Kilometre 202½ (126 miles) is now indicated by notice boards. In early 1917, however, things went awry with the British, who were foiled in their attempts to capture Gaza. A change in commanders was made, and General (afterwards Field-Marshal Viscount) Allenby was sent out. He made his headquarters at Kilab, near Kilometre 205 (127½ miles), the site being marked for years afterwards by the piles of wire entanglements. Gaza, 236 kilometres (146 miles), now reached in five hours from Kantara East by the restaurant and sleeping-car expresses of the Palestine Railways, was hard to achieve in those days. It was not captured until the battle of November 7, 1917. The distance of 256 miles from Kantara East to Haifa is now covered by express trains in ten hours. Between Rafa and Gaza, at Khan Yunis, 131 miles, in an earlier war, Napoleon had one of the narrow escapes of his career. His main army took a wrong route that led into the desert. Napoleon and his staff rode into the town. The Arabs in the main square thought Napoleon and his staff were the entire French army, jumped on their horses and rode off in a hurry, instead of stopping to capture the emperor. A BRIDGE REPLACEMENT over the River Kishon in Northern Palestine. The photograph shows the original structure below temporarily supporting the new bridge. Many railway bridges, built as temporary measures during the war, have since had to be renewed. In the summer of 1917 the railhead of the British Army was at Deir al-Belah, 220 kilometers (136½ miles), the name meaning “House of Dates”. It was dubbed “Dear Old Bella” by the British troops, who turned the Wadi el Guet, 227½ kilometres (141 miles), which the line crosses by a bridge, into the “Waddy Guzzy”. “War Baby”, a tank put out of action by the Turks in the first battle of Gaza, is seen to the right of the line at 231 kilometres (143½ miles). About a mile and a half farther on is the hill down which, so tradition says, Samson carried the gates of Gaza. Gaza, 236 kilometres (146 miles), was one of the five cities of the Philistines of the Old Testament. When the Royal Engineers brought the railway to it, they also carried their pipe-line, so that the water was brought all the way from the distant Nile. In addition to building a military railway down through Beersheba, the Turks had also built a line down the coast to Gaza. Allenby captured Beersheba, then Gaza, and pushed north along the coast as far as Jaffa, which fell on November 17, 1917. He gained the railway junction, and the Royal Engineers laid a line from Rafa to Beersheba, and took the lines as near Jerusalem as possible. Allenby then fought his battle and entered the city of Jerusalem, on December 11, 1917. STEEL SLEEPERS have been laid on the line between Jaffa and Jerusalem. This railway was built in 1892 on the metre-gauge system, and was operated by a private French company. The track was later changed to 105 cm. gauge, and finally converted to the standard 4 ft 8½ in gauge by the British Army. The Royal Engineers established railway connexion all the way up the coast as far as Acre, relaying the line from Haifa to Acre, and also that between Jaffa and Lydda on the Jaffa-Jerusalem Railway, both of which had been dismantled by the Turks. On the other side of the country Colonel Lawrence and the Arabs were destroying the Hedjaz Railway. 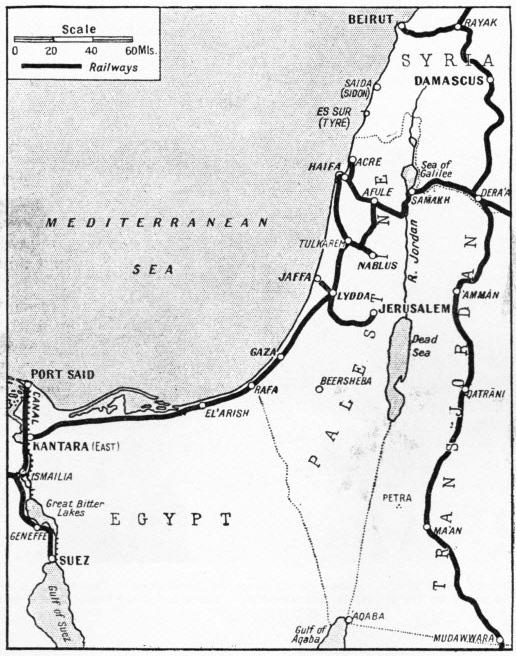 Palestine was finally conquered when Damascus was captured at the end of September, 1918. The building of their own railway lines, and the destruction of those of the Turks helped the British to achieve the victory. Because of the nature of the country, railways were the only means of handling the heavy transport required by both armies. After the war the line laid from Rafa to Beersheba by the British was dismantled, as well as that the Turks had built extending south through Beersheba. Returning to Gaza and resuming the journey from Kantara East to Haifa, we proceed through the land of the Philistines to Majdal (161 miles), opposite Ascalon, which lies to the left of the line on the coast. Ashdod (169 miles) was one of the five ancient cities of the Philistines, which included Gaza and Ascalon. The name of Palestine has been derived from the word Philistine. Soon after Yebna, 178½ miles, the line bends eastward away from the monotony of the sand dunes of the coast into what was once the country of the Tribe of Dan and is now an area of thriving Jewish colonies. Crossing the Jaffa-Jerusalem main road, the line arrives at Lydda, 187 miles, the most important railway junction in the country. Jerusalem is forty-five miles distant, the time taken for the 228 miles from Kantara East to Jerusalem being nine and a half hours. Proceeding towards Haifa, the line passes through olive groves to the Plain of Sharon. A short branch runs to Beit Nabala on the right of the line. The country is occupied by Jewish settlements, one of the oldest and most prosperous of which is Petah Tikvah (“The Gate of Hope”), which has a short branch line, eight miles long, as it lies on the left of the line from Ras el Ain (199 miles), and exports large quantities of oranges. The colonists contributed towards the cost of building this branch. To the right of the line rise the mountains of Samaria. From Kilometer 325 (202 miles) a good view is obtained of Mount Gerizim (2,849 ft), on the top of which the ancient Samaritan sect still performs the Passover Sacrifice. At Kalkilieh, 207½ miles, the traveller sees Mount Ebal (3,077 ft) in the distance. 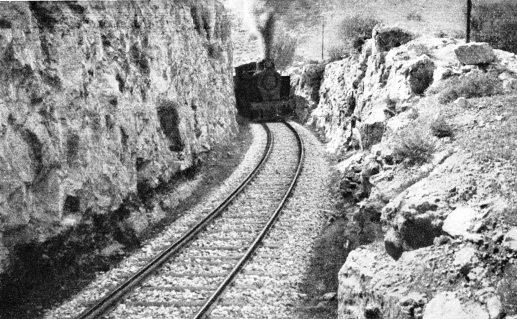 Tulkarem, 214½ miles, is the junction for the 105 cm branch of the Hedjaz Railway, which runs to Nablus for a distance of twenty-three and a half miles through Massoudieh. Since the line connecting Massoudieh with Afule was abandoned, as already stated, the branch has been cut off from the parent line of the Hedjaz Railway. This branch line has to climb up from the Plain of Sharon to Nablus, which lies in the long, narrow valley between Mounts Ebal and Gerizim, and is the Shechem of the Bible. Abraham pitched his tent here on entering the country, and set up an altar on a slope of Mount Ebal. It is the ancient home of the Samaritans, who still cling to it, and are the only distinct representatives of ancient Israel in Palestine. Of the total of 157 in the country in 1922, 132 lived in Nablus. The total increased to 195 persons by 1929, of whom 161 lived in the city, which is of considerable importance. Jacob’s Well, associated with the woman of Samaria, is just outside the town. Proceeding from Tulkarem, the main line proceeds across the plain, Khudeira (225½ miles) being the station for a large Jewish colony. The line now approaches the coast again, and at Kilometre 380 (236 miles) it is possible to look back along the shore and see a large mound which is part of the ruins of Caesarea. That once mighty city was mainly built by Herod and became the civil and military centre during the Roman occupation. It was the scene of many fights between the Crusaders and the Saracens. Ahead can be observed the long slope of Mount Carmel, on the other side of which lies Haifa. The line passes Athlit (243½ miles), and the lighthouse and the Carmelite Monastery come into view on the top of Mount Carmel at Kilometre 406 (252 miles). From this monastery the Carmelite Order spread all over Europe. The line goes round the northern end of Mount Carmel along the shore, opening up a view of the Bay of Acre, Haifa Station being 256 miles from Kantara East. Haifa lies at the foot of Mount Carmel on the southern shore of the Bay of Acre. In 1933 the High Commissioner for Palestine opened the new harbour, which makes Haifa the most important port in this part of the Levant. The railway played an important part in the making of the new port. Palestine and Syria have since the the war of 1914-18 become vitally important channels of world communication. Tyre and Sidon lie on the coast between the modern ports of Haifa and Beirut, and these two ancient ports, long derelict, were once among the greatest in the world; from them sailed the Phoenicians to the barbarian west, the Eastern traders penetrating as far as Britain. To-day this coast is becoming once again a junction for traffic between the East and the West, but with a difference. Modern sea and air liners and fast trains have displaced the galleys, sailing ships, and camels of a slower age. Railway and sea developments were hampered by the lack of a sheltered harbour for the whole coast, as no harbour had been constructed in Palestine since Herod built Caesarea. The Palestine Government selected Haifa. There are twelve miles of sandy shore around the Bay of Acre to the town of Acre, broken at the point where the River Kishon enters the sea. A main breakwater, 7,250 ft in length, was built, and a lee breakwater of 2,510 ft to protect the harbour from the north. The stone was obtained from the quarries at Athlit, some ten miles away, and was hauled over the railway. 115 ft and two spans of 31 ft; a double track connects the workshops with Haifa Station. This track, with a third rail between the standard-gauge line, enables trains of either gauge to use it. The buildings, of steel and asbestos cement, consist of locomotive, machine, carriage, wagon, pattern and paint shops, a foundry, a smithy and a power house, and occupy about 400 acres. There is one disadvantage about Haifa, the water is bad for locomotives; but that has been overcome by sending the locomotives a short distance to Acre Bay, where the water is good, to take in fresh supplies when necessary. The Jaffa-Jerusalem Railway, the first in Palestine, as already stated, has had a more varied experience of gauges than most railways of its age and length. It began in the ‘nineties with a gauge of one metre. During the war the Turks changed the gauge to 105 cm, and later dismantled the stretch between Jaffa and Lydda. Then the Royal Engineers laid the track to 60 cm. The Palestine Railways eventually relaid the whole fifty-four miles to the standard gauge. The section of twelve and a half miles from Jaffa to Lydda is easily graded, but the climb up into the hills and to Jerusalem is steep. The broadening of the gauge compelled the railway to order six 2-8-4 Kitson tank locomotives capable of hauling 250 tons, also to send six tender engines to England to be converted to side-tank engines for passenger service on this line. The ruling gradient on this section was 1 in 37, and the curves on the line - which, of course, was built for the metre gauge - were as sharp as 361 ft radius in some instances. There were sixty curves of less than 656 ft radius. Check rails, spiked to the sleepers, were provided for curves of less than 492 ft radius, but these did not counteract the distortion of the track. Eventually the wooden sleepers were replaced by steel ones, and check rails were applied by means of cast check blocks which were bolted to the running rail. ACROSS THE SUEZ CANAL. 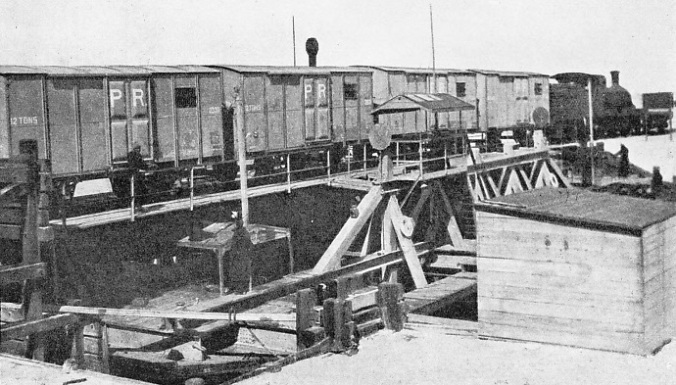 A train of twelve-tons freight wagons owned by the Palestine Railways being transported over the famous canal. The Palestine Railways have over 2,300 wagons in service. Over thirteen miles of the section between Artuf (thirty-one miles) and Jerusalem have been relaid with steel sleepers. Most of the rails in Palestine are of 75 lb section, 36 ft long, and have from fourteen to seventeen wooden sleepers to the rail. The wooden sleepers are obtained from Anatolia, and are cheap, though they last for only about eight years. Although termites (white ants) are found in some parts of Sinai, they are not so destructive as in other parts of the world. Their ravages were checked by removing the affected sleepers and treating them with oil. The line from Jaffa climbs steeply after Artuf. Beyond Bittir, forty-seven miles, it has 600 ft to mount in seven miles. The track climbs the Valley of Roses, and skirts the Plain of Rephaim, and so gains Jerusalem, fifty-four miles, the city being 2,600 ft above the sea. Turning from the standard-gauge lines to the Hedjaz Railway, we are confronted with a line that has always been unusual. 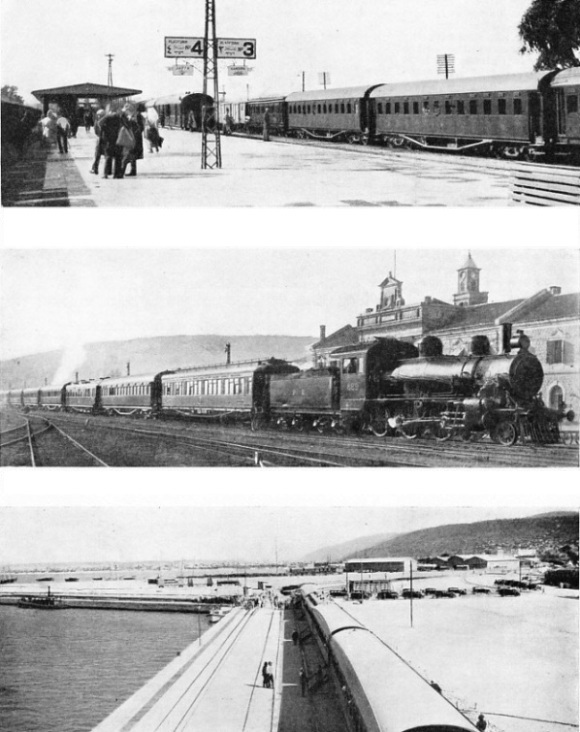 The length of main line operated by the Palestine Railways is fifty-four and a half miles from Haifa to Samakh, at which point the line enters Syria, and a stretch of 210 miles from Nessib, or Nasib, on the Transjordan frontier, through the Transjordan capital Amman, to Maan. South of Maan the line is not in use. The station at Mudawara, seventy miles south of Maan, on the disused section, lies on the frontier of Saudi Arabia. South of Maan the line has suffered from the depredations of thieves, who have stolen hundreds of rails. It has been difficult to punish the thieves, because in the past old rails were sold officially in Transjordan, and it is almost impossible to distinguish between bought and stolen rails. After leaving Haifa the line crosses the River Kishon and runs across the Plain of Jezreel to Afule, where it crosses the road from Jerusalem to Nazareth, and soon after falls below the level of the sea as it enters the valley of the Jordan. The river is reached soon after passing Beisan, the Old Testament Bethshan, where many objects have been found showing the town to have been the centre of a serpent cult. Above this place the line turns north along the Jordan, which it crosses at Jisr el Majame. This spot is 700 ft below sea-level, and is said to be the lowest point on any railway in the world. Samakh, on the Sea of Galilee, is the frontier station, and the line from here to Nessib is controlled by the Franco-Syrian authorities. Connexion with the trains from Damascus is made at the junction station of Deraa. At Nessib the line passes into Transjordan and is again under the control of the Palestine Railways for the remaining 201 miles to Amman and Maan. On Tuesdays, Thursdays, and Saturdays trains leave Deraa for Amman, and in the reverse direction. Trains leave Amman for Maan on alternate Wednesdays and make the return journey on alternate Fridays. The building of the Hedjaz Railway from Damascus to Medina, 1,105 miles, was a remarkable achievement which aroused the enthusiasm of Moslems in every part of the world except the Hedjaz, now part of the kingdom of Saudi Arabia, and the country in which are situated the holy cities of Mecca and Medina. Mecca is the birthplace of Mahomet, who is buried at Medina. The railway never reached Mecca, although it did reach Medina, from which point the pilgrims had to walk about 300 miles. Every Moslem is required by his religion to make the pilgrimage to Mecca at least once. ORANGE WAGONS on a siding at Rehovot Station. 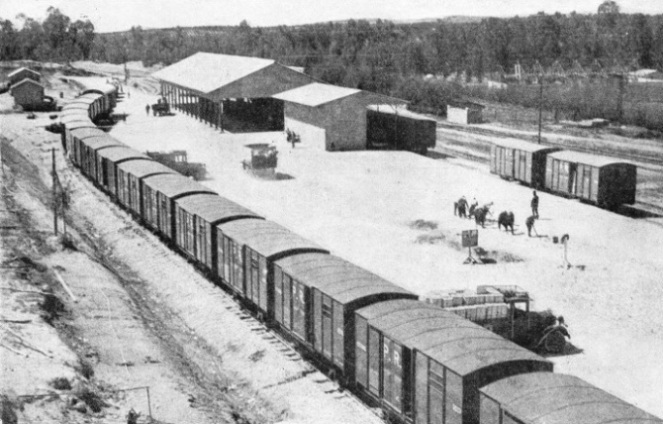 The transport of oranges forms an important item in the freight traffic carried by the Palestine Railways; in recent years the export of oranges from Jerusalem has steadily increased. The Turks said that the Arabs robbed, and killed the pilgrims who travelled down from Damascus by the overland route and that the railway would prevent this. On the other hand, the Arabs, who had a large measure of independence under the Turkish rule, said that the railway would enable the Turks to tighten their hold on Arabia. The determined attacks which were made on the construction gangs and the troops building the line seem to suggest that these were not made by isolated bands of wanderers trying to stop a railway that would prevent them from robbing pilgrims, but were the attacks of men trying to hinder what they considered to be a menace to their freedom. A German engineer, Meissner Pasha, was given the task of building this railway, which was afterwards fated to play a vital part in the destiny of Turk and Arab. Field-Marshal Kaisim Pasha was given command of the troops, who not only had to conduct a campaign to protect the gangs at work on the line, but also to act as navvies. Although Damascus was the nominal terminus, constructional material had to be brought from the coast. Conditions at Haifa were much better than at the port of Beirut. It was therefore decided to drive a line from Haifa and Acre across the valley of the Jordan, some fifty miles of which would be below sea-level, and then lead it up through the wild valley of the Yarmuk, beyond Samakh, and link with the route from Damascus at Deraa. Use was made of a short length of line at Haifa. This had been built by a British company which had obtained a concession from the Turks but had afterwards failed. The conquest of the valley of the Yarmuk was a fine piece of engineering. The track had to be cut in the sides of the mountain, and taken across deep gorges and over rushing torrents. From Jisr el Majame, near Samakh, 700 ft below sea-level, the line had to rise to 300 ft above sea-level near Deraa. The section from Deraa to Maan was much easier. At first the line runs roughly parallel with the valley of the Jordan, which is about midway between the railway and the coast. Amman, where David took refuge from Saul, is connected with Jerusalem by a road which passes through Es Salt, crosses the Jordan by the Allenby Bridge, and passes through Jericho to Jerusalem. The railway continues in a southerly direction to Maan, where traffic now ends. From time to time proposals have been made to repair it and reopen it to Medina, and even to link it with Mecca, but these have fallen through. The railway was of great value to the Turks in the war, Lawrence realized this, and began his campaign of dynamiting it. The line he destroyed had conquered great difficulties, as the country it traversed in the Hedjaz Peninsula varies in altitude from 200 or 300 ft below sea-level to nearly 4,000 ft. It climbed up from Maan to an altitude of 3,700 ft, and at Batn el Ghoul, or “The Devil’s Belly” had to go over the brink of a wild chasm. Meissner Pasha took the line down in a series of corkscrew turns by blasting the rock of the ravine, which is devoid of any form of vegetation. He continued across a plain to Tabuk, after which he had to climb to an altitude of 3,700 ft. The last section of the line towards Medina was put in charge of a Moslem, as the Moslems would not permit an infidel to approach this sacred place. OUTSIDE JERUSALEM STATION. One of the first lines in the Holy Land was built from the capital to Jaffa, the port of Palestine. The original railway was granted a concession for seventy-one years by the Ottoman Government in 1888. One attack by Bedouins was in the nature of a battle. The navvies were armed with rifles and supported the Turkish soldiers, but the railway builders had to stop work, although the raiders were driven off with the loss of a hundred dead. Batteries of artillery and other forces were sent to the aid of the Turkish commander, and a battle was fought, during which the Bedouins suffered such heavy losses that for some time they did not attack in force. When an attempt was made, however, to continue the line from Medina to Mecca, the tribesmen massacred all the workmen in the construction camp, and the project was abandoned. As soon as the Palestine railways took over all the lines in Palestine and Transjordan, and the Kantara-Rafa line in Sinai from the British Army, they had to set to work to turn a military system into one which would serve the needs of a very mixed community. 0-6-0’s, seven being former London and South Western engines. Of the tanks, six were 4-6-2 Baldwin tanks, with a tractive effort of 24,449 lb., and six Kitson tanks with a tractive effort of 32,149 lb. The six Baldwins were converted from the tender type, and the six Kitsons were specially built for the climb up to Jerusalem, as already stated. The fifty-one locomotives of the Hedjaz Railway are of greater variety. On March 31, 1934, these were nine 0-6-0’s, seven 2-6-0’s, twenty-six 2-8-0's of various types, six 2-8-2’s and three 0-10-0’s. These last have a tractive effort of 25,944 lb. There were also on March 31, 1934, ninety-five standard gauge and forty-three narrow gauge coaches, and 2,007 standard gauge and 358 narrow gauge wagons. Petrol rail motor vehicles comprised six 20 hp Drewry cars which were allocated three to each gauge. The rails on the Hedjaz line are of 45 lb section, and steel sleepers were used. Sections built thirty years ago are easier to maintain on this well-built, well-ballasted and well-drained line than on the Jaffa-Jerusalem line, although the lines near the coast are subject to corrosion and conditions of traffic that do not affect the lighter gauge track in the interior. Thousands of young trees grown in the railway nurseries at Lydda have been planted along the line at various places, and also at the workshops, to act as windbreaks and to prevent the sand from blowing on to the track. The locomotives taken over from the Army were more numerous than the traffic required. Because of the inferior water at Haifa the engine failures due to leaky tubes and other boiler trouble have been frequent. When trade and industry recently increased in Palestine, the locomotives which were in good condition had to be run for a long while without being over-hauled, and there were more instances of failure. But the new workshops are improving this state of affairs and better water is now being used. Some delay in catching up with repairs was due to the transference of the main workshops at Haifa to the new site, and also from the sub-shops at Kantara East. Another point has been the keen competition of the roads. The road from Jaffa to Jerusalem took a good deal of traffic from the railway, as the locomotives hauling the standard gauge trains over this section were not powerful enough to be fast, and motor transport reaped the advantage. The mileage of the railways, including sidings, is as follows: standard gauge, 396 miles; 105 cm gauge, 320 miles; total, 716 miles. At the time of writing the prospects for the railways are better in Palestine than in many parts of the world, as both passenger and goods traffic are growing. The Dead Sea, one of the most remarkable stretches of water in the world, is also helping the railways, as potash from it is taken by road to Jerusalem and then put on the railway for export. IN THE SINAI DESERT. Mazar Station, situated on the Kantara Rafa Railway. This line was constructed by the Egyptian Expeditionary Force during the war of 1914-1918. You can read more on “In Northern Africa”, “In the Nile Valley” and “The Taurus Express” on this website. AN IMPORTANT JUNCTION. The station of Lydda where lines from Jerusalem, Jaffa, Haifa and Kantara meet. Platforms 3 and 4, seen above, accommodate trains for Kantara and Jaffa respectively. It is said that St George, the patron saint of England, was buried at Lydda. A LONG-DISTANCE EXPRESS train leaving Haifa Station for El Kantara. The trains cover the distance of 256 miles between Kantara East and Haifa in ten hours. The expresses include sleeping and restaurant cars. AT HAIFA HARBOUR, which was opened in October 1933. The Hedjaz Railway gives Haifa access to Transjordan and Syria. There is an entrance 600 ft. Wide and a space of 300 acres of sheltered water enclosed within the main and lee breakwaters for ships. The photograph shows a a tourist train at the port.